Synopsis: A group of student activists travel from New York City to the Amazon to save the rainforest. However, once they arrive in this vast green landscape, they soon discover that they are not alone – and that no good deed goes unpunished. Thoughts: Though I’m an aficionado of horror and have welcomed with open arms the resurgence of the retro scare fest, I’ve never totally warmed to what director Eli Roth has done so far in his career. Though his films have had their share of style, they’ve wound up feeling like the juvenile product of an overgrown frat boy making movies that his friends would get a kick out of. After brutal films like Cabin Fever, Hostel, and Hostel: Part II, Roth’s directing has taken a backseat to producing and acting. 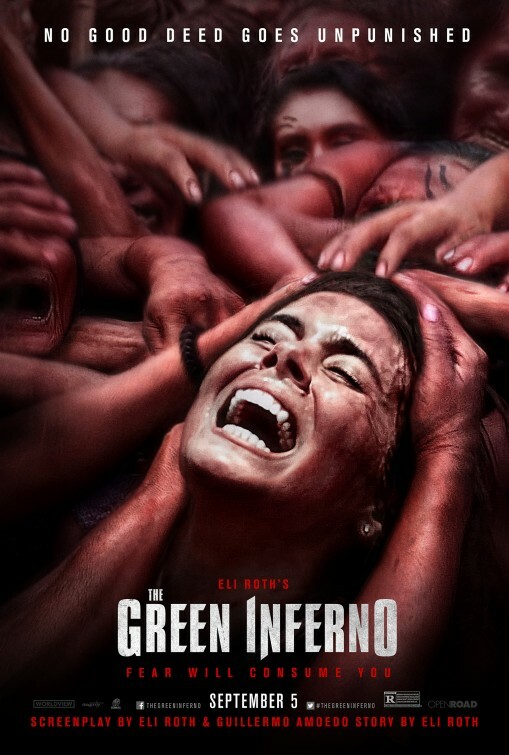 Roth’s back behind the camera for his take on the popular jungle cannibal films from the 70s/80s with The Green Inferno and it looks like he’s developed another challenge to the stomach and squirm factor of his audience. I’ll catch this one (behind covered eyes, I’m sure) to see if Roth has matured as a filmmaker…but one can only hope for so much.